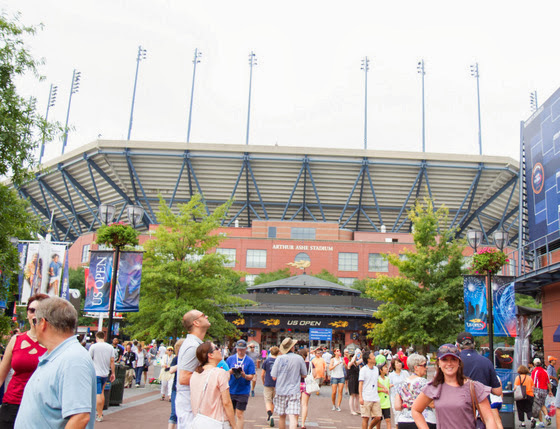 Next to eating, one of my favorite activities is watching tennis and it’s always been my dream to attend the US Open at Flushing Meadows. When I lived in Long Island as a child, every summer the newspapers would be filled with information about the US Open. It was only a short train ride away which made not being able to attend even more frustrating. But my parents didn’t feel comfortable with me riding into the city by myself since I was so young and neither of them were big tennis fans. 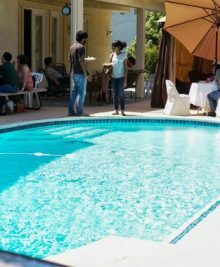 For the past few years, I’ve marked Labor Day weekend as the best time to attend: it’s a long weekend and most of the top players are still around. But it seemed every year, something came up during Labor Day weekend. Finally, this year, I wanted to make it happen. I grew up idolizing Pete Sampras and while it was obviously too late to watch him play at the US Open, I’ve also really admired “The Big Four” and wanted to watch while they were still competing well. 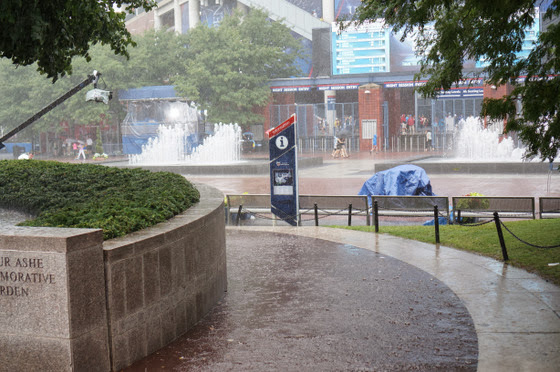 Rain is always an issue at the US Open and I really hoped we would have some good weather. 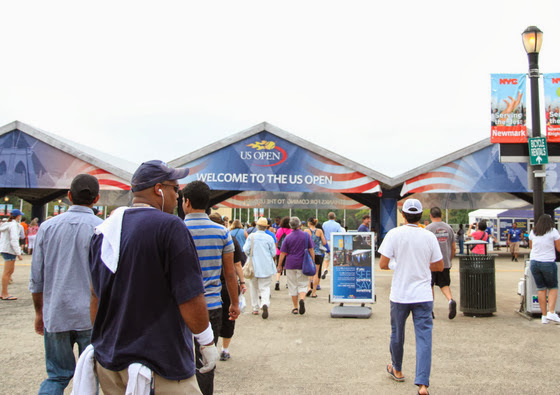 Of course, the day we had purchased our tickets for (Labor Day), ended up being the worst weather the US Open 2013 experienced in its two week run and the only day when the day session was considered completely rained out. 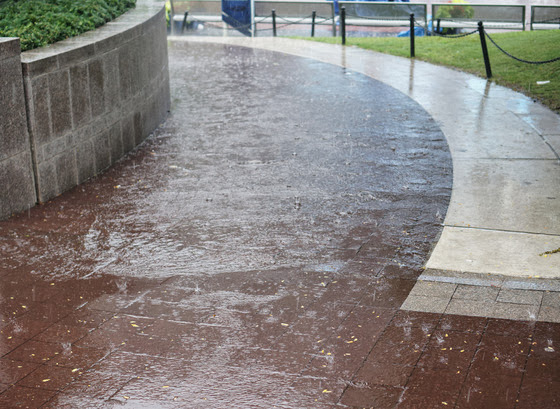 I’d forgotten what East Coast rain can be like, after being spoiled by San Diego weather. 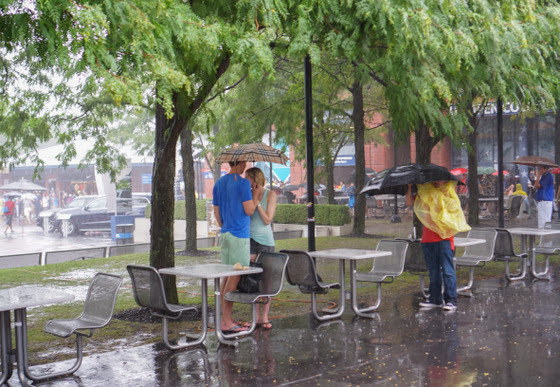 Our puny umbrellas didn’t stand a chance in the torrential downpour. Within seconds after the first drop, the grounds were completely soaked and we, along with all the other visitors, spent our time huddling under various roofs for cover to wait out the rain. But we made the most of the situation, and ended up accomplishing almost everything I had wanted to, including getting to see some of my favorite players practicing and getting autographs. We arrived right when the grounds opened in the morning and before the rains came. 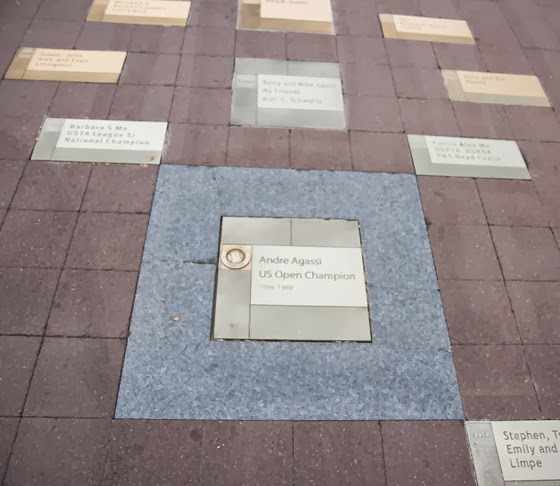 A practice schedule was displayed in front of Ashe Stadium, giving us an idea of who was practicing when. 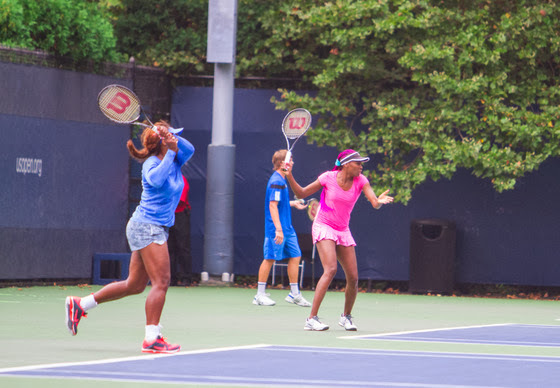 As a result, we were able to watch Serena Williams, Venus Williams, Roger Federer, and Milos Raonic practice in the morning. 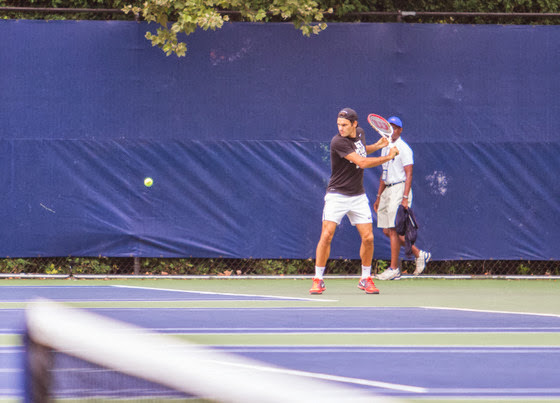 As the time for Roger Federer’s practice session drew near, people really began to crowd the entrance, in a hope for a glimpse and an autograph. I had come equipped with one of those giant balls for signature. I knew my best shot of getting an autograph was actually enlisting the help of Mr. K. Based on our years of Comic Con attendance I’ve learned that I get swallowed up and am completely invisible in a crowd (even if I’m standing right there in the front), whereas for some reason Mr. K usually catches the eye of whoever is controlling a crowd, handing out free stuff, etc. Just as I had hoped, Mr. K caught the attention of Roger Federer as he was leaving and was one of the first to get a signature. 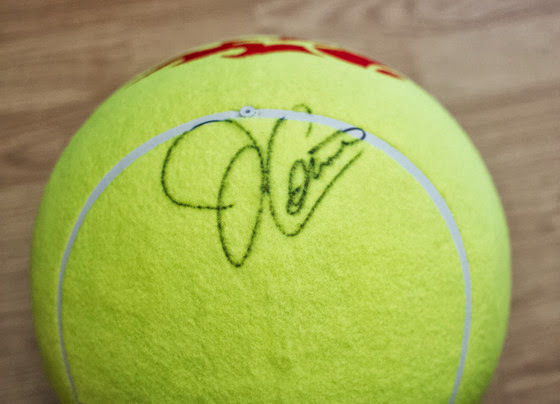 What really impressed me though was that Roger Federer took his time to completely make his way down the line to sign as many signatures as possible, showing why he is such a popular sports figure. 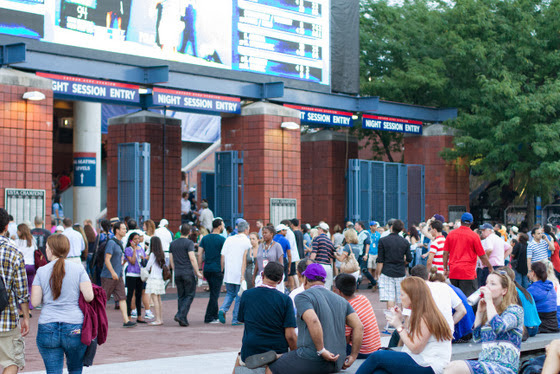 The line had gotten pretty long and the people towards the end had been informed that they wouldn’t have a chance since players usually just sign the front of the crowd and leave but Roger Federer took his time and went all the way through the line. It was soon after that the rains came. 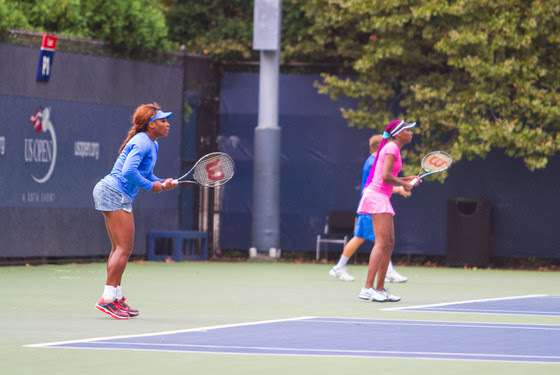 We tried to stay dry hanging out on the outskirts of Ashe Stadium. During the delay, we got some food. I got to hang out with a friend of mine who had recently moved to the East Coast. We also purchased a grey goose cocktail which came with a souvenir glass. 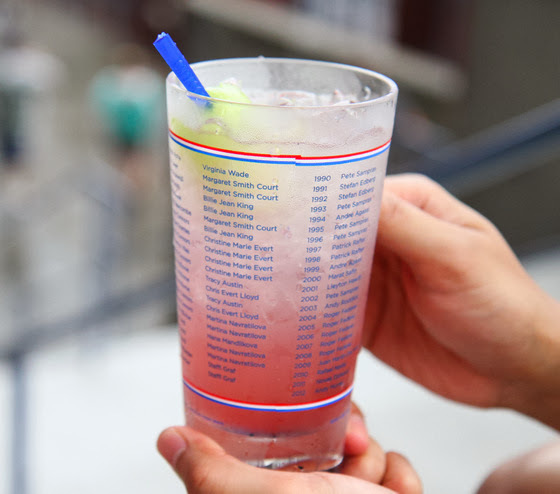 Normally I wouldn’t even think about purchasing a cocktail, but I really loved the glass, which lists all the past winners, and every year they come out with a new one with the different year so it’s a nice item to collect. The rains lasted most of the afternoon, finally clearing up around 4 pm, with the night audience already starting to trickle in. 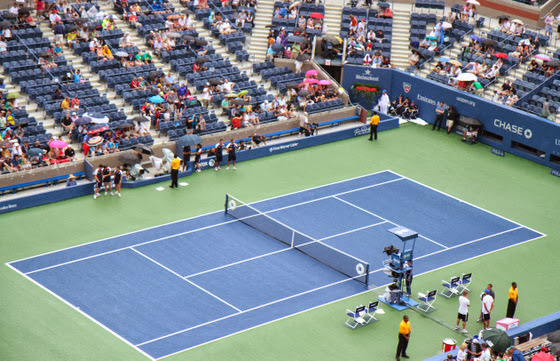 As a result of the rain, several matches were moved around. We scrambled around to see as much as possible. Normally day ticket holders can’t see night matches, but since they were all day session matches that were just being played into the evening, we were able to watch them. One of the great things about the ticket passes is that other than the show court, you can visit any of the other courts to watch. Some of the courts are really intimate, allowing you a really close view. 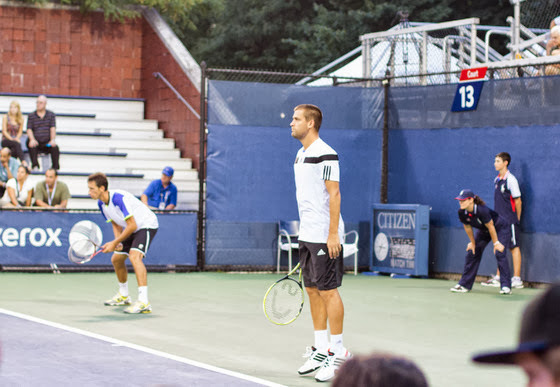 During this doubles match, we were so close that I’m pretty sure they could hear me talk. 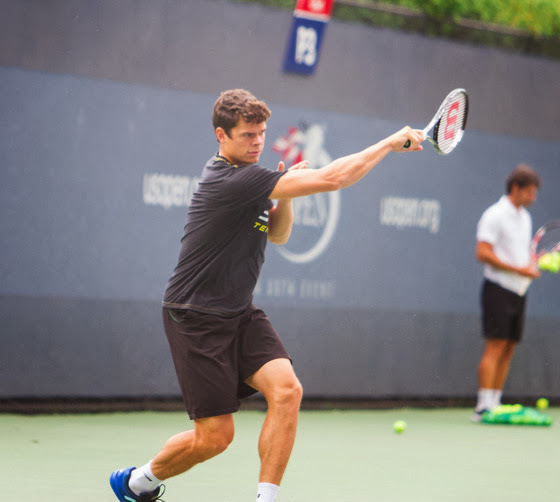 Of course, I couldn’t resist one more visit to the practice courts. 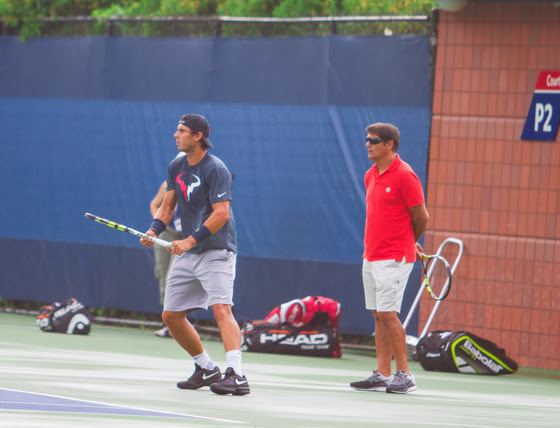 I no longer knew who was practicing due to the rains, but I knew Rafael Nadal was scheduled to play that night so I was hoping to catch a glimpse of him practicing. And sure enough, there he was! Out of the big four, he is definitely my favorite. I worried as we waited for autographs that he might do something to disappoint me, as often happens when you idolize a celebrity and then meet them in person. But he was great. Just like Roger, he signed a ton of autographs, including my ball. 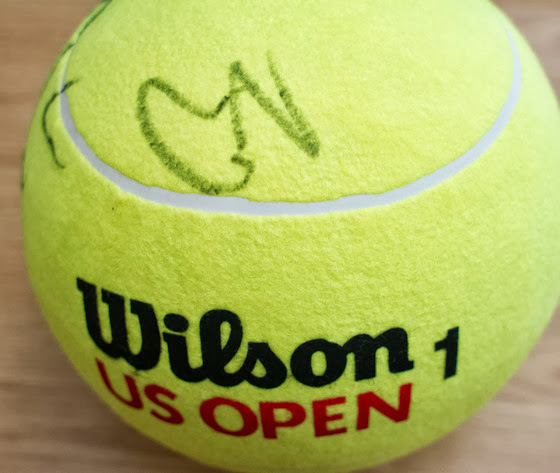 Of course, after two signatures by two legends and former #1 players in the world, Mr. K suddenly decided that he didn’t want our ball to be filled with just any signature. 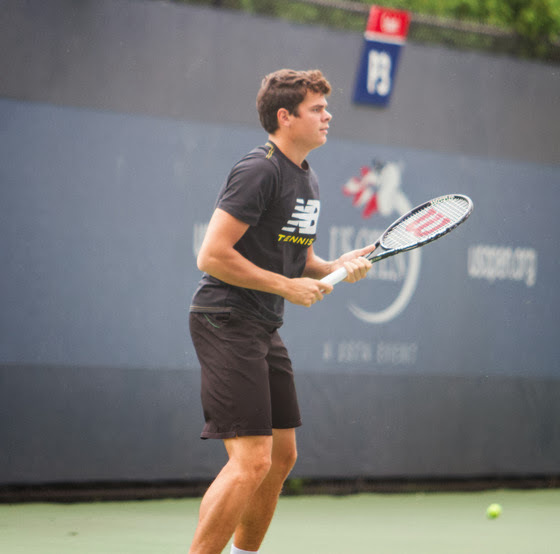 We passed right by Mikhail Youzhny (a consistent top 20 player), as well as some other recognizable players, but Mr. K dubbed them not good enough for the ball! Haha. 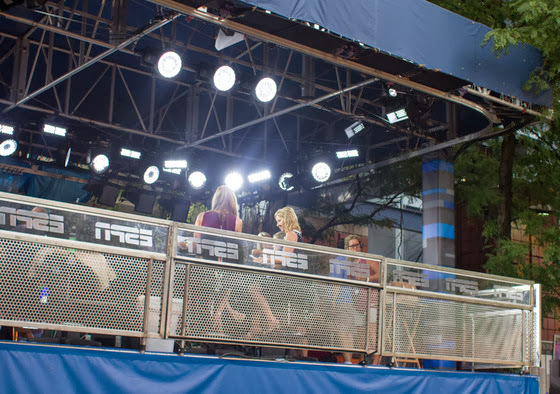 Chris Evert at the ESPN broadcast booth! While waiting to get into one of the stadiums, I suddenly had this urge to take a walk around to see some of the exhibit centers. Mr. K was puzzled and I wasn’t sure why, but I just had this feeling. 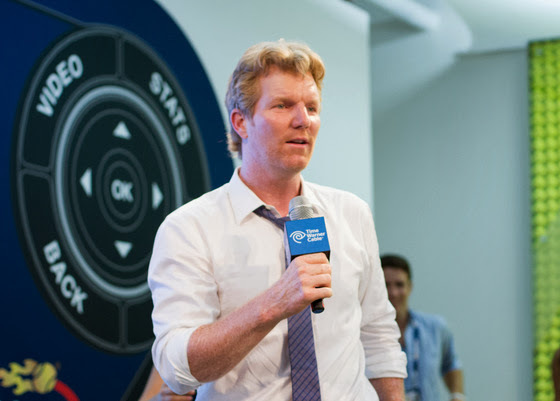 Sure enough, we walked over to the Time Warner lounge and they were about to start a discussion with Jim Courier. We were able to sit in the second row and listen to him talk. Afterwards we were able to get pictures and autographs. Since he is a former #1, Mr. K deemed him worthy of getting a spot on our ball. Despite the rains, we had a pretty fun US Open. Visiting the year Nadal ended up winning made it even sweeter. Since our session was considered rained out, we actually are supposed to be able to get tickets for next year’s session. I don’t know if I can convince Mr. K to visit NYC two summers in a row. 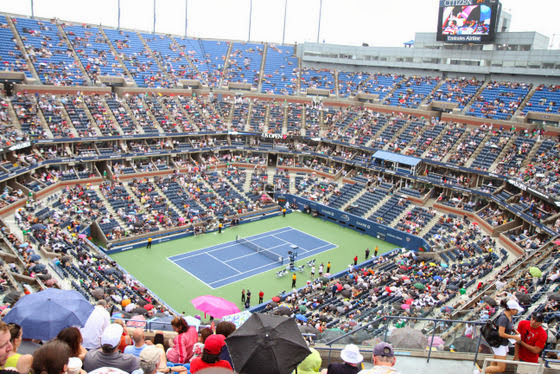 I personally would actually rather wait until 2015, when there will be a roof over Ashe so no more rain delays. The next day we were able to visit Epicurie Boulud, where if you show your US Open tickets, they give you a free giant tennis macaron! The macaron was quite large, with lemon flavored shell and a marshmallow filling that has raspberry jam in the center. It was dusted with sugar to make it look more like the fuzz of a tennis ball. 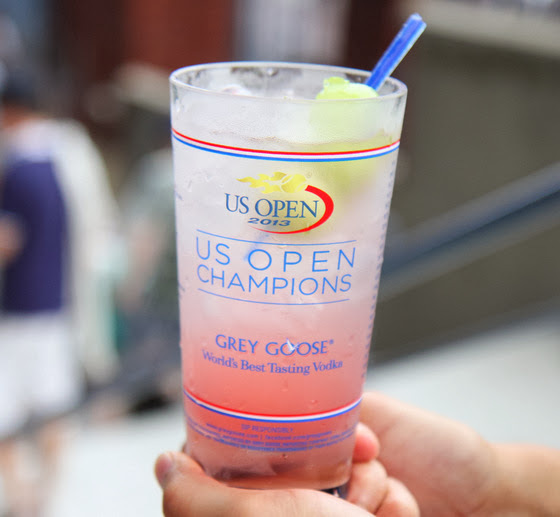 Until next time, US Open! Very nice post. It’s nice to see events from a real perspective. 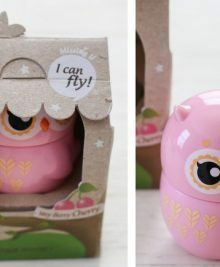 Cute macaron! I loved that macaron! So pretty, I almost didn’t want to eat it. Very nice! We liked this post very much, especially Bert (who went to the US Open in 2007). 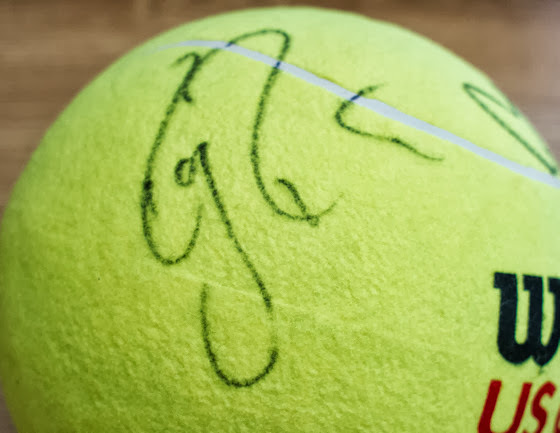 He liked the giant tennis ball with the select signatures. 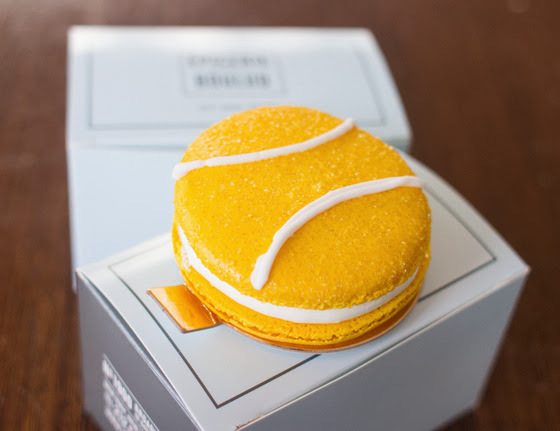 I liked the tennis macaron! 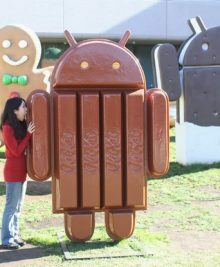 🙂 What flavor was it, just curious. I’m glad you and Bert enjoyed the post. It took a long time to write and go through all the photos. heh. Oh I should have talked more about the macaron. It was a lemon macaron, with a marshmallow and raspberry filling. The white part is the marshmallow and there was some raspberry jam near the center. so cool! 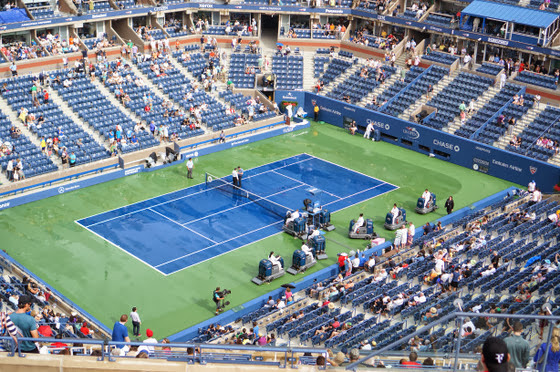 this is this year’s USOPEN ? how long in advance did you have to request and buy tix ? 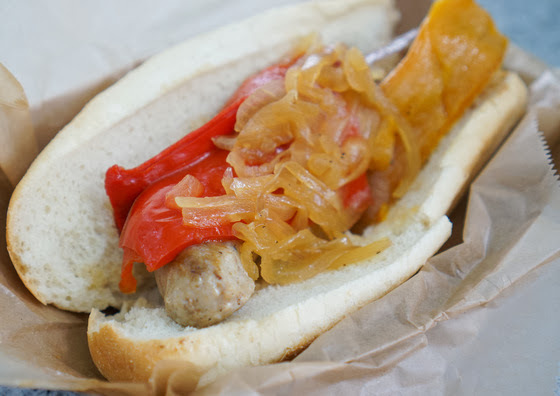 Ah I meant to leave a comment when this post first came out but S was so entranced by this post. Hahaha. We had just been talking about how we’d like to go to the US Open. It’s so awesome that you got both Federer and Rafa’s signatures!! Too bad about the rain, though… I definitely don’t miss that about the east coast. Oh I’m glad you enjoyed the post! 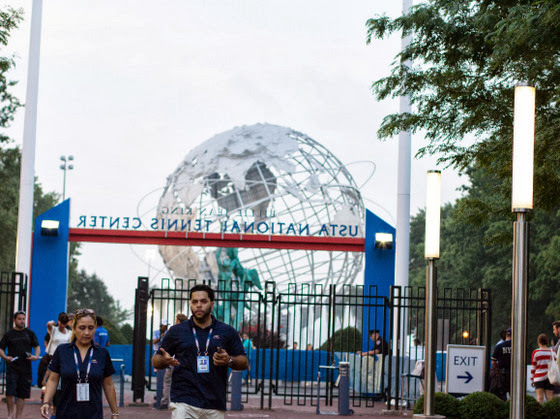 The US Open is definitely worth a visit if you can. Plus they will have roofs by 2015, so the rain shouldn’t be a problem. I’ve also been to Indian Wells, which is nearby Palm Springs. It’s actually quite nice and all the top players are there and the grounds and courts are really nice. It feels like a mini US Open and you can see a lot of the players practicing and stuff there too.